I would be very glad if people take the time to read about knives and quality with SAKs on sakhome.com. I have discussed and talked much about locking mechanism and professional tools. Depending on what use the services require you would probably today implement locking mechanism and one hand opening. Such a philosophy is also smart when you custom make a set of tools for survival or outdoors needs as well. It may sound weird that in my opinion one hand opening blades with locking mechanism are actually knives developed with a reduction process. This is because a package of tools is going to do several tasks and not only one. The set of functions are going to fulfill the philosophy of use by the services. Reduction process is also the demand and practice with the functions. One example is a one hand opening blade with locking mechanism can be used with gloves and a minimal mindset during use. He or she does not have to worry about accidental closing. 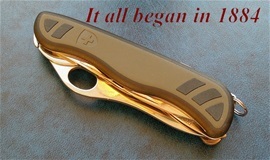 When the blade or function is used then he or she can be occupied for rescue and saving lives. Reduction process is important because services handle more than knives and if you sum this up then it can be too much to have in mind. Out of date equipment may take much time to use. Sturdy functions, locking mechanism and one hand opening must be present today. During emergencies people use more strength on the equipment and therefor it must be more solid made. It is not so that one should forget correct use and it is still so that many can use traditional slip-joint knives. I usually mention that if you have learned to use traditional SAKs then you have learned the correct use. I always say that knives with locking mechanism should be used as there is no lock at all. I would recommend locking mechanism and one hand opening for professional outdoors needs. Some of this is also because you can get larger tools that also saves time. This means that you can implement in the equipment large 130mm or 111mm knives with the set of functions your philosophy requires. “Survival is reduction process without any doubt and it is about learning to survive with the minimal set of equipment” Reduction process is already done = One hand opening, locking mechanism, sturdy large functions in one package custom made for such….. The secret to the Swiss Army Knife is the spring. It is impregnable and it can be used for great many tasks. When you do not have a locking mechanism then you are fully dependent on the slip-joint spring mechanism. When you have learned to use such then you know correct knife use. On the picture is the fireman belt-cutter or rescue blade and it does not have a lock. These blades are typically used in reverse. This mean the edge is facing up towards you. A slip-joint mechanis...m involves a symbiosis in spring tension and designated use. It would be a problem if the spring tension is so low that when you use the blade in reverse and when the part you are cutting releases then it could in theory accidental close over your hand. I have tested this many times and the design of the belt-cutter, slip-joint spring and construction does not accidental close. In a way one could support it with the thumb as well when you are cutting a belt for example close to the body of a person if necessary. That is the only extra part you must be aware about with a pure slip-joint mechanism. In theory if you would use the tip section of the serrated blade in reverse during extra force it could accidental close. The spring is in my opinion designed exactly to prevent this with the correct dimensions and quality. 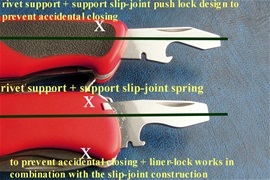 The slip-joint spring secures opening, closing, holding in and out. It support the blade during use. When you before-hand make a custom set of tools or select a tool with functions that your philosophy require then you also know how to use it. Reduction process involves knowing when to use other cutting blades than the main blade. Knowing when to use the wood saw and not. In survival it is about having the main blade sharp and ready all the time. It is therefore smart to use the wood saw for the larger tasks and know how to improvise. The wood saw is already made by reduction process because of the Swiss philosophy. Larger blades save time and they can be used for larger tasks. A combination blade with plain end serrated is a perfect example on reduction philosophy. The combination blade alone is not enough for many tasks anyhow. Additional functions are usually required by services. The combination blade is very good and it is smart. Serrations/waves on knife blades do not work on wood. It is absolutely best on rope, belts and webbing. The wood saw can be used on wood, bone and different materials. It is best on wood but can also be used as a heavy duty serrated blade. It does not have a lock and therefore it must be in the practice. Reduction of the possibility to accidental close can be done on SAKs by the spring tension and the design. On knives without locking mechanisms you rely on the slip-joint spring and design. Most important is what I have explained about correct use. 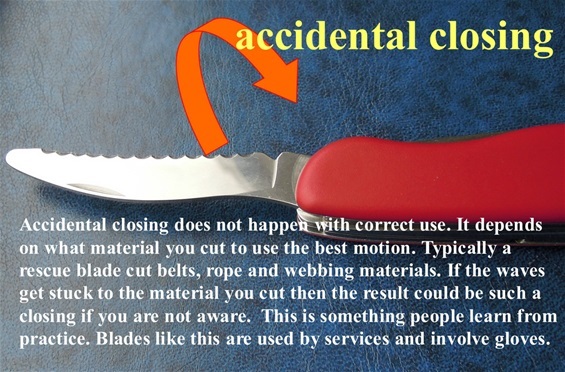 That said on or at one point it is unavoidable that you must have locking mechanism to be called a rescue blade or safe equipment. 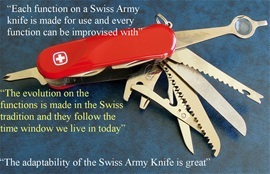 The evolution on Swiss Army Knives for professional use is going in the right direction and it is unavoidable. It is absolutely not a modern invention with serrated edges and locking mechanisms. I would like to take out two values and one is functionality and the other is innovation. The quality development is going in the correct direction because you get larger and stronger tools. The advantages are many with this. Innovation is in my opinion obvious with the ability to make new functions and to be able to adapt into the new demands in the world. It is a shame in my opinion that many countries misunderstand the need for One Hand Opening and locking mechanism. 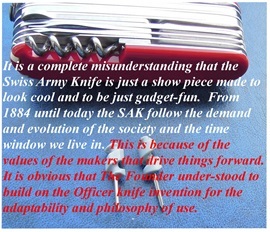 Serrated edges as well….On Swiss Army Knives you can if you study them see the clear path towards a better product. It is about making it better and better. The advantage with professional tools is the same for the professional outdoors person. It is cool to see that this dates back to the beginning. Comfort is a dangerous factor in my opinion because people are not aware about accidents before they suddenly are in it. It is the same with knives if you do not know how to use it. It is important with some training and practice with functions. Doing so you reduce the possibility for apathy and you use the reduction philosophy there too. I am not a believer in only using one knife today. It is better to have a package of tools. It is a great joy and satisfaction for people to decide what SAK fit their need best. Most people therefore use reduction philosophy to find what knife and functions are best. Some go for far more functions and is happy with this. You never know when you are going to need it. I know that the functions on SAKs are made for use no matter how unlikely it may sound. It is a known fact that because the SAK is so it has saved time, lives and avoided damage. 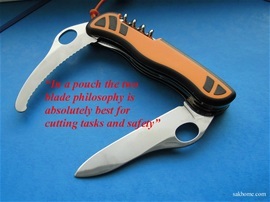 “By using my reduction philosophy developed for rescue and safety then the two-blade philosophy is absolutely best. Both got OH and locking mechanisms. This tool also got an easy to see color and it got ergonomic handle scales with slip resistant parts. It got large functions that save time with a sturdy construction” By having two blades with the different design and edges then you can cut more materials. Wavy edge is also very much misunderstood today. It is made to cut difficult materials better. It is to save time and it is made for better safety in general. The wavy edge will stay sharper for a longer time….. When researching SAK for many years I learned that you can develop special purpose designated tools and functions. It is always a risk to rely fully on this all the time. SAKs usually or very often got additional functions that some call standard functions. On the services range this can be the can opener, awl and corkscrew for example. The large flat screwdriver shown above in this page is better because it is larger for bigger tasks and it got the lock on it. So my advice is to have in the philosophy to have several functions that included standard functions and the blades. Reduction philosophy developed by me can be used for special purpose task for services and other. Include backup as well.